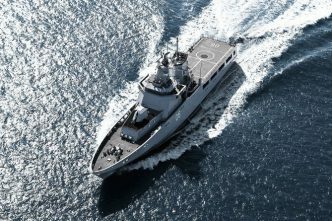 My previous post looked at the greater value for money Australia will derive from the program of continuous warship design and construction it is commencing compared with the stop–start method of the past. 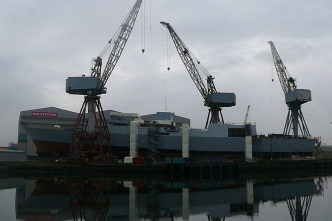 This part examines the concept of critical mass in continuous shipbuilding. Nations with large economies and large navies, such as the United States and China, have sufficient critical mass for continuous design and construction programs. 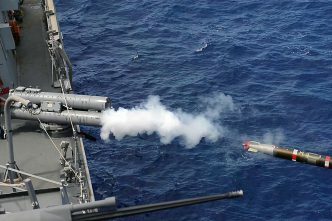 By contrast, smaller nations such as Pacific island states or even New Zealand are too small (both as economies and as navies) to have sufficient critical mass to justify a continuous program. What, then, is the threshold, the critical mass, at which a continuous production program is likely to provide value for money and how can it be calculated? One way to identify the critical mass is to look at the size of a nation’s economy and the size of the part of the navy it intends to support through continuous production. A larger economy and a larger fleet size would tend to support the conclusion that a continuous program is value for money. 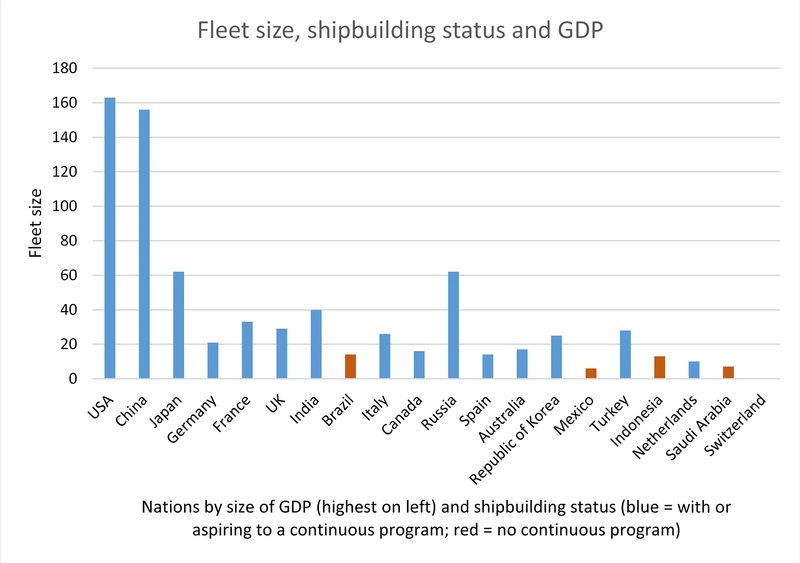 This methodology is both quantitative and qualitative because it acknowledges the agency of sovereign governments in making decisions according to differing strategic circumstances and doesn’t propose that there’s necessarily a direct relationship between economic and fleet size, on the one hand, and the viability of a continuous shipbuilding program on the other. Why the choice of these two metrics? The size of the economy is an important consideration for two reasons. First, a country’s economy needs to be of a sufficient size for shipbuilding to be sustainable without unreasonably constraining other productive activities. Second, a country that meets this criterion is likely to have the diversity and depth of productive capacity to support the manufacture of a modern warship. The size of a country’s fleet is important because it gives an idea of its demand for warships. Production of a new ship every two years is about the minimum rate required to efficiently occupy a shipyard which could support a fleet of 10 vessels with a service life of 20 years. Brazil, Mexico and Canada have smaller fleets than might be expected, which partly reflects their proximity to the United States and its approach to hemispheric defence and influence. Germany, France, the UK and Spain also have slightly smaller fleets than might be expected, which is in part a consequence of the decreased maritime threats faced in post–Cold War Europe and, in the case of Germany, its continental geography. The Russian fleet is larger than might be expected, which reflects a lower level of preparedness across the fleet than would be the case in Western navies (smaller fleets are likely to have higher levels of readiness), and also the higher proportion of GDP that Russia allocates to defence spending compared with many other countries. As far as Australia is concerned, the number of vessels planned for production means the fleet size will trend towards something that might be more in line with fleet sizes of nations of similar economic size. 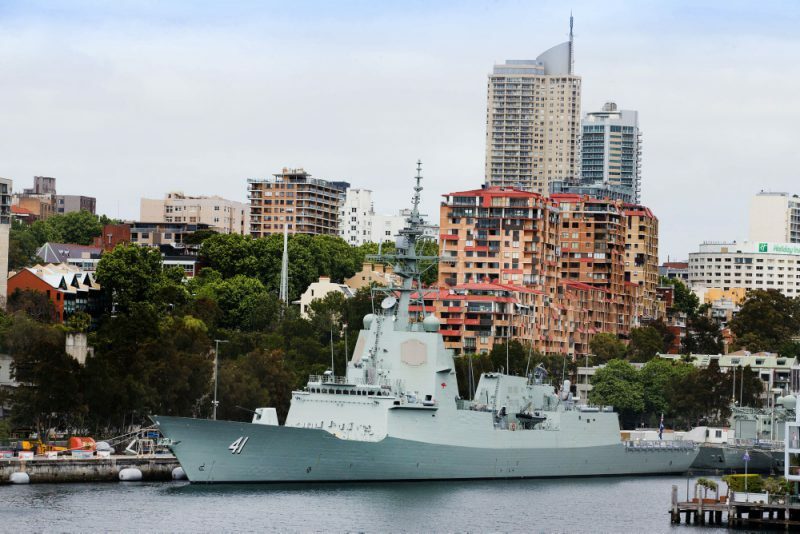 Significantly for the program of continuous design and construction of warships, Australia’s economy and fleet are already similar in size to those of nations like Canada, Spain, South Korea and Turkey, which produce or aspire to produce their own warships. 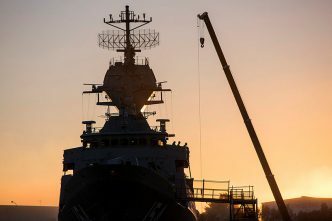 From this perspective, the choice Australia has made for a national enterprise of continuous design and production for its future frigates, submarines and offshore patrol vessels looks like a logical one that’s consistent with the choices similar nations have made. 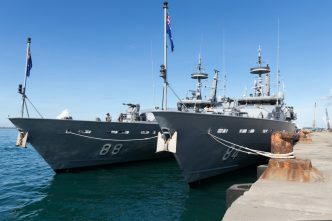 It certainly provides a basis from which Australia can adapt the size and overall capability of its maritime force to suit its strategic circumstances.